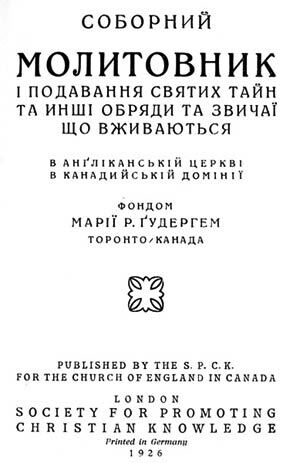 This Ukrainian translation of much of the 1918 Canadian Book of Common Prayer is the most substantial translation to have been published in any Slavic language. Its publication took place during the later stages of Ukrainian immigration to Canada, which had begun in the early 1890s; today Canadian Ukrainians represent the world's third largest Ukrainian population in the world, following only Ukraine itself and the Russian Federation. Although most Canadian Ukrainians are members of various Roman Catholic and Orthodox churches, the most recent available statistics identify about 20 per cent of the 10,000 Ukrainian protestant Christians as members of the Anglican Church of Canada. Canadian-American philanthropist Mary Reford Gooderham (1863-1955, née Duncanson), sometime President of the Imperial Order of the Daughters of the Empire, funded the translation. It was prepared under the direction of the Right Reverend William Reid Clark (Fourth Bishop of Niagara, 1911-1925) and the Reverend Canon Frederick Charles Piper of Saint John’s Church, Thorold, Ontario (dates unknown) and dedicated to the sacred memory of Maksym Charles Khavruk. The text was completed on 13 May 1924, but printed only after a delay in 1926. Statistics Canada reports that as of 2001, more than 200,000 Canadians (primarily in Ontario, Alberta, Manitoba, Saskatchewan, British Columbia and Quebec) speak Ukrainian at home; Ethnologue identifies some 40 million speakers worldwide. 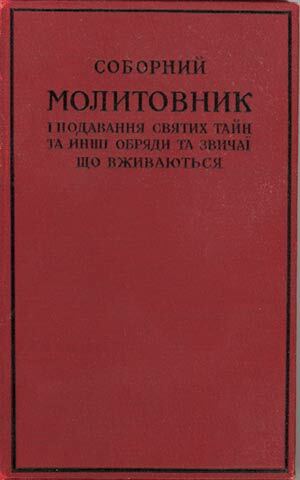 Because of the nature of the Cyrillic script used, the text is presented here as a series of PDF graphics. Accordingly, the Adobe Acrobat Reader is required to view the files; it is free and if you don't have it, you may obtain it from Adobe. You will likely need to magnify the images for easy reading. This book appears in David Griffirths' Bibliography of the Book of Common Prayer as 185:1. Thanks to Richard Mammana for the scans and images of this book, and for the introduction above.